I nice cross-section of theme and tone there, I think. 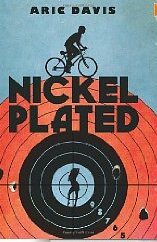 I also bought Aric Davis’s Nickel Plated but after reading the first chapter I just had to carry on reading to the end. It’s supposed to be a teen novel – the main protagonist is only twelve - although the principal theme of paedophilia is pretty heavy, and scary in places too. I found that I had to suspend disbelief about Nickel’s age and if this is ever made into a movie (it should be) a slightly older actor would probably carry it more effectively. And the ease with which he trawls the internet for sensitive information is perhaps a little exaggerated. But it’s still a snappy and sharply written story. I hope there’s a sequel. What warms me even more to Nickel is that the kid knows how to eat. Okay, he eats a bunch of fast food too – pizza rolls, chicken dippers, PB&J sandwiches – but he knows they’re rubbish. He'd rather go out and have Thai food or top quality steak but his circumstances (I won’t give away anything in case you decide to read it) make that a little tricky. I’m off to Wales for two weeks next Monday. Gravestones, swans, an old WW2 tank and Michael Sheen are on the menu. I also need to make some welshcakes as I was driving between Wales and England on 1st March and missed my annual bake-up. But I did make cakes last week. Cake that works for dessert as well as standard ‘slice of with a coffee’ eating. I think the original recipe is Nigella’s but I fiddle with it depending on what I have and don’t have. You probably get the mix and match picture now. Cover the clementines with water, bring to the boil and simmer for 2 hours making sure they don’t boil dry. When they’ve cooled, take out any stalky bits and pips and puree what’s left, skin and all. Beat the 6 eggs, mix in the almonds, sugar and baking powder and then add the clementine puree. It will be sloppy – don’t worry. I’ve used a big 9” spring-form tin and I’ve used a smaller 7½” tin and I’ve made little cupcakes. But whichever you choose you MUST line the tins with paper or use paper cases. The quantity of sugar in the cake makes it susceptible to burning and the paper forms a barrier. The mixture also doesn’t rise that much so you can fill the little paper cases quite close to the rim. Cook at Gas no.5 or 190° electric for up to an hour but check after 40 minutes. Crème fraiche is a good choice. Or Grand Marnier flavoured buttercream icing is pretty lush too. And it forms part of your 5-a-day. In my book. Write about reading on holiday. Write about being twelve years old.